Have I mentioned that it's holiday season in the polish world at the moment? Well if not, then surprise! All brands are starting to release their Christmas goodies. 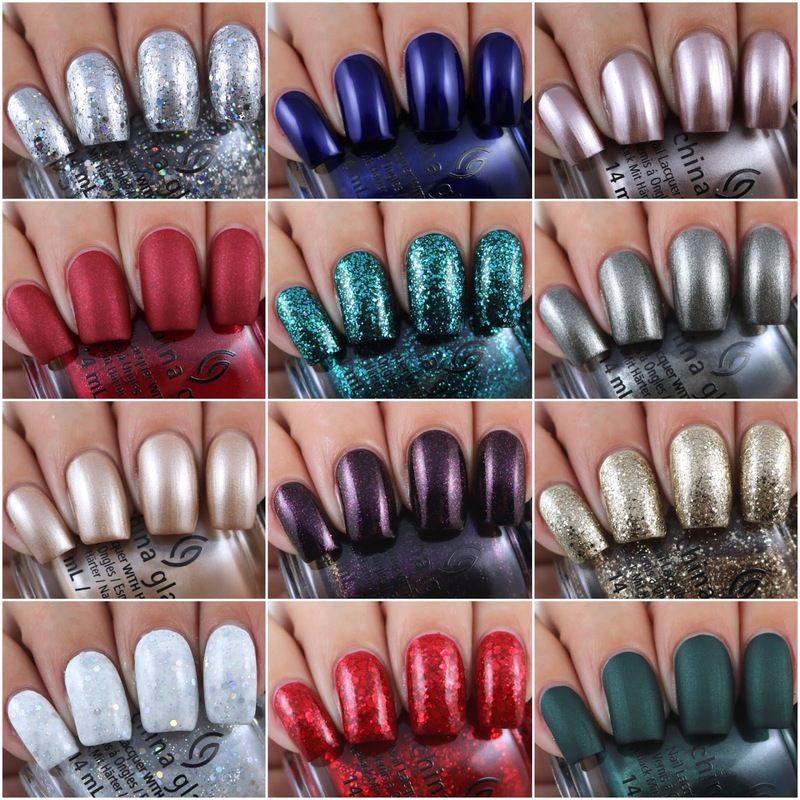 So far I have shared with you Grace-full Nail Polish's Vintage Christmas Collection (you can see that here if you are interested) as well as OPI's Love OPI, XOXO Collection (which is here if you missed it) and I do have a few more Christmas goodies coming. Today I have China Glaze's holiday collection - The Glam Finale Collection. There are twelve polishes with a range of finishes. As Good As It Glitz is described as a lilac golden metallic. I think this is such a pretty colour and it's really shiny. The formula is easy to use and is close to being one coater. It does have some visible brush strokes when it is wet but it does even out as it dries. I used two coats for my swatch. Big Hair & Bubbly is a clear base filled with gold glitter in various sizes. This one could build up to be opaque in three plus coats (or you could easily sponge it on) but I decided to use it as a topper so you can see how much glitter is in it. The formula is easy to use and there is a good amount of glitter. For my swatch I used one coat over Models Own Chrome Gold. Disco Ball Drop has a clear base with holographic glitters in various sizes. This one is definitely a topper as the glitter is quite sparse (or you could sponge it on, but it would take a lot of work to really build it up to be opaque). I really wish that this was more glittery than what it is. My swatch shows two coats over Model's Own Chrome Silver and two coats of top coat. Don't Be A Snow-Flake is a milk crelly with holographic glitters. The base is quite sheer and would need at least four coats to be opaque (three coats still have a visible nail line) but it's easy enough to work with. I used two coats over a white base. New Year, New Boo is described as a royal blue shimmer. This is probably my favourite from the entire collection. The colour is gorgeous (although it does make my camera freakout) and the formula is awesome. My swatch shows one coat. Queen Of Sequins is a dark purple shimmer. This is another really pretty polish. The formula is good and is opaque in two coats. 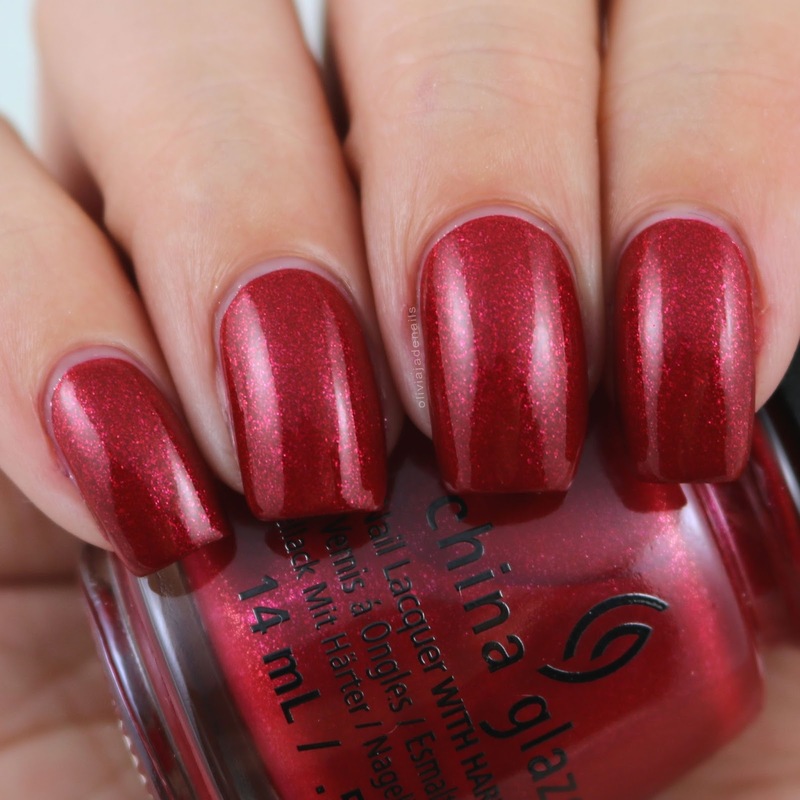 Santa's Side Chick is a berry red shimmer with a matte finish. I love the matte finish on this one. I don't know why but there is just something about it. It also looks good with top coat. The formula is fantastic and close to being a one coat. My swatch shows two coats. Slay Bells Ring is described as a grey metallic. This is a great shade too. I think it's quite unique (well at least in my collection). The formula is great and applies evenly. I used two coats for my swatch. 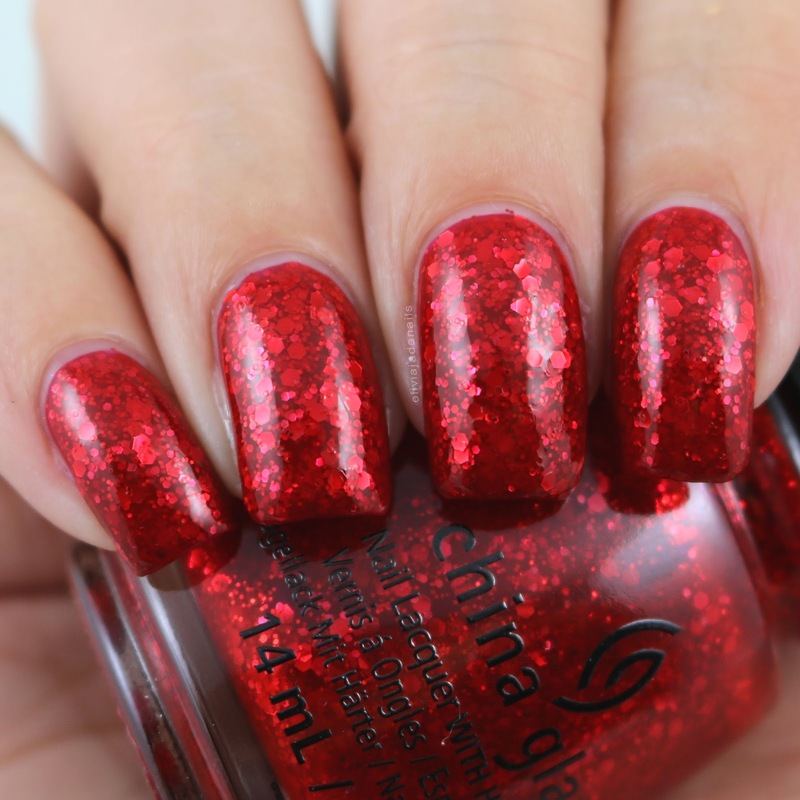 Sparkle On is a red jelly with red glitters in various sizes. I love the depth in this one. The formula is also easy to use. My swatch shows two coats. Teal The Fever is blue-green glitter in a clear base. Again, this is one of those glitters that can be worn as a topper or can be worn alone. It's super easy to use and has a great glitter payoff. I used one coat over China Glaze The Perfect Holly-day. 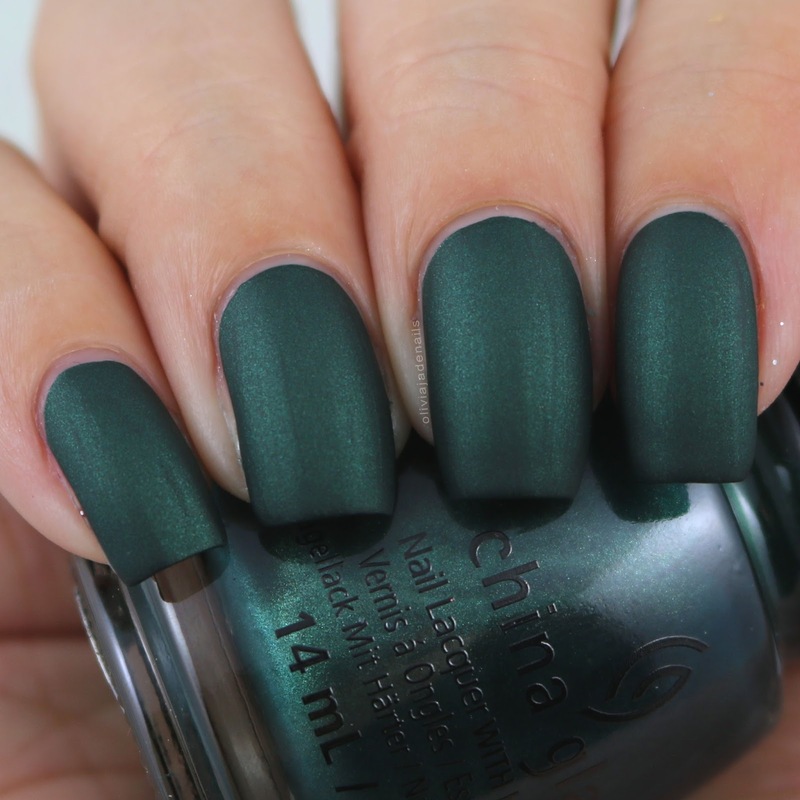 The Perfect Holly-day is described as a yellowish green shimmer with a matte finish. I really like this one, however it does crack. I tested it one a swatch stick first and it cracked and I was hoping that it wouldn't on my nails. However, on the first coat is cracked on a few of my nails but managed to be ok on the second coat (until I added top coat). You can see where the cracks are from the first coat. Minus the cracking, the formula is great and easy to use. It is a one coater if it didn't crack open. My swatch shows two coats. Toast It Up! is described as a golden champagne shimmer. The formula is easy to use, however it is a little on the sheer side. I used three coats for my swatch. There is definitely some great polishes in this collection, and then the rest of it is a bit neutral for me. Not neutral in colour, but they are polishes that I don't love but also don't hate. My personal picks would have to be New Year, New Boo, Santa's Side Chick, As Good As It Glitz, Teal The Fever and Slay Bells Ring. You would think by now China Glaze would have fixed their matte formula. Nice collection though. It is a nice collection! I'm not sure what the go is with these matte polishes. I have seen a live swatch video and she didn't have any issues with the polish cracking. Maybe I just keep getting dud bottles? I have tested them on other people as well as swatch sticks and mats and they always crack so I know it's not my body chemistry causing it. Yessssssssss I've been waiting for a swatch post of these as yet again I have my eye on at least 1 of them. ADORE New Year, New Boo but then again I love most blue polishes haha. Also digging Teal The Fever Too. Where could you get CG in Melbourne? I think the only places that sell CG in Melbourne are nail supply stores. I haven't purchased any CG polishes in Melbourne for about three years or so. I find that the collections are really far behind here so I buy mine online from the US.